Prior work has been completed on understanding how an organization’s decision-making approach can influence the selection of alternative vendors when setting up a supply chain system. Teams using different decision-making approaches on identical performance data did end with different vendor recommendations. One possible explanation of this result was that the data set on vendor performance was limited to five vendors and four variables; however the decision-making approaches had significantly different cognitive requirements. The team members preferred cognitively simple approaches such as Weighted Sum and to a lesser degree SMART with this relatively limited data set. The more cognitively complex approaches, TOPIS, AHP, and ELECTRE, had lower preference levels. This paper reports on an extension to the original work where team members utilized the same set of five decision-making approaches, but applied them to a more complex vendor selection problem. Results indicate that the vendor selection recommendations had less variability than the previous study, team members appeared more comfortable with their results, and better able to explain their work to managers when approaches that were more cognitively complex were used. The team members did report some time issues completing their work with some decision-making approaches. This proceeding is published as Componation, Paul J., Michael C. Dorneich, Guiping Hu, and Gillian M. Nicholls. 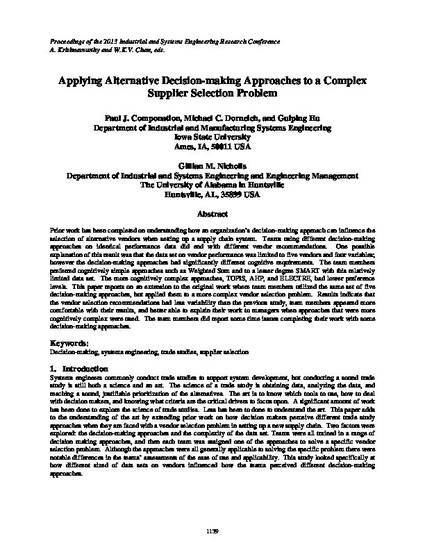 "Applying Alternative Decision-making Approaches to a Complex Supplier Selection Problem." In Proceedings of the 2013 IIE Annual Conference and Expo. Institute of Industrial Engineers (IIE). Pages 1139-1147. May 18-22, 2013, San Juan, Puerto Rico. Posted with permission.